The former president, challenged about how his sexual transgressions look in the #MeToo world, responded with a defense that stressed how much he had done for women as a politician. To a considerable extent, that is besides the point in today’s context, where putative supporters of women’s rights (such as New York Attorney General Eric Schneiderman) have been forced to step down because of disturbing allegations about their treatment of women. We are not going to fact-check the entire statement. Clinton later in the interview admitted he had not personally apologized to Lewinsky, the intern with whom he had an affair while president. He had simply apologized in general, which is not what the interviewer originally asked. We were amused that Clinton slipped in the phrase “for their percentage in the bar” when he bragged that women were overrepresented in his office when he was attorney general in 1977-1979. That’s a low bar. Between 1918 and 1970, 164 women gained Arkansas law licenses; 22 percent of law licenses were held by women by 1998, two decades after Clinton was attorney general. We could not find an exact figure, but one could imagine the percentage would have been far lower in the late 1970s. But two of his statements stand out as worthy of deeper fact-checking. There’s another wrinkle. The disclosure forms do not require the listing of homes used for personal use, and the Clintons had two — a $1.7 million, five-bedroom home in Chappaqua, N.Y., and a $2.85 million, five-bedroom home in the District. The first one was bought in 1999 with a big loan by their pal (and later Virginia governor) Terry McAuliffe. But the Clintons put $855,000 of equity into the second one, the White House said at the time. This document came up in the Paula Jones lawsuit against Clinton for, yes, sexual harassment. Discovery in Jones’s case, of course, exposed Clinton’s affair with Lewinsky and led to his impeachment. A. It is. I signed it in 1987, and I’m fairly sure that I was, we were, the first or one of the very first states to actually have a clearly defined sexual harassment policy. Yikes, quite a burn by Fisher. In other words, Clinton is bragging today about a state policy that merely implemented new federal guidelines, probably as a result of the 1986 Supreme Court ruling in Meritor Savings Bank v. Vinson that sexual harassment, including a hostile work environment, was indeed sexual discrimination. It’s not as if he was a trendsetter. It’s also worth recalling the allegations made by Jones that led to her sexual harassment lawsuit in federal court. In 1991, while Jones was working at a state-sponsored conference, a state trooper asked her to meet with then-Arkansas Gov. Bill Clinton in his hotel room. When she arrived, she says, Clinton tried to kiss her and then dropped his pants and underwear and asked her to “kiss it.” She refused and quickly left the hotel room. Her account was backed up by people who said she told them at the time about the alleged encounter. Pamela Blackard, a state employee sitting at the registration desk with Jones, said she noticed Clinton staring intently at Jones and witnessed a state trooper asking Jones to go to Clinton’s hotel room. She recalled that about 10 minutes later, Jones returned, “shaking,” and she told Blackard in detail about Clinton’s actions. Blackard told her to tell no one, as she was afraid they would lose their jobs. Ultimately, the Jones case was dismissed by a federal judge, who ruled that even if her allegations were true, such “boorish and offensive” behavior would not be severe enough to constitute sexual harassment under the law. That ruling was under appeal when Clinton in 1998 settled the suit for $850,000, with no apology or admission of guilt. 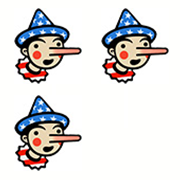 In both cases, Clinton skirts close to Four Pinocchios. He did have large legal debts, perhaps several million as he once said, but $16 million is clearly wrong. In any case, he and his wife were able to quickly dig themselves out of that hole. As for the sexual harassment policy, he was simply implementing federal guidelines — and it’s an odd thing to brag about, given the circumstances. "I left the White House $16 million in debt"
"I had a sexual harassment policy when I was governor in the eighties"